SINGAPORE - The first of three anti-scam commercials was launched on Saturday by the National Crime Prevention Council (NCPC) and the Singapore Police Force (SPF). These commercials, which will be rolled out progressively in 2015, are produced as part of the nationwide anti-scam public education campaign. The first commercial aims to remind the public on how scammers often manipulate victims' emotions, desires and weaknesses to make a successful transaction. It features cyber extortion and lottery scams, which are among the top 10 scams in Singapore. Police statistics showed that the crime rate in 2014 increased by 7.4 per cent - from 29,984 cases in 2013 to 32,196 cases in 2014. The number of reported cyber extortion scam cases rose by 138 per cent - from 108 in 2013 to 257 in 2014. Lottery scams increased by 43 per cent - from 213 in 2013 to 304 in 2014. The other two commercials will cover money mule and online purchase scams and will broadcast on local TV channels later this year. 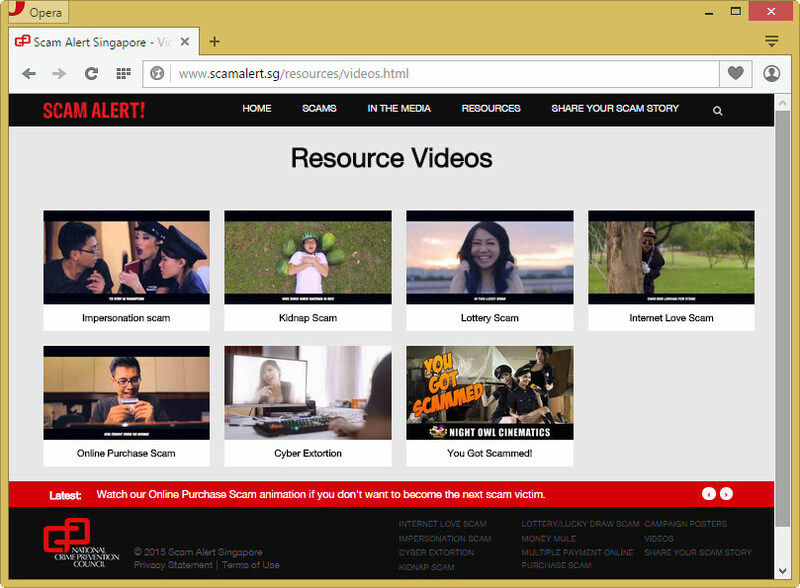 Last year, the NCPC and SPF launched a website, www.scamalert.sg, on how the public can protect against online scams.